Chelsea played last season with a white third kit – so for ‘08/09, they’re going with a bolder choice of uniform for those special matches where neither blue nor black will do, or when they just want to shine a bit more. Official Chelsea Football Club 08/09 Third Short Sleeved Soccer Kit from adidas. This gorgeous bright yellow uniform with blue trim is a marvelous addition to the Chelsea kit collection, and is sure to look great on Ballack, Deco and Terry, as well as on YOU. 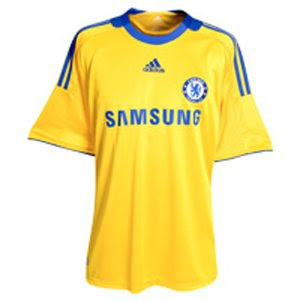 The jersey includes embroidered Chelsea team badge over your heart, and adidas logo at center chest, with screened sponsor logo at front, embroidered Chelsea FC on collar, and Chelsea FC taping along the inner hem. Made with ClimaCool® - advanced material engineered to reduce heat and moisture build-up, allowing increased comfort and performance – to keep you feeling fresh no matter how long the big Blues match - and post-match celebrations - goes on!